Mauritius Weather in Summer. . .
Mauritius weather in summer coincides with cloudy skies and chilly conditions in most of Europe. As winter starts covering the northern hemisphere making the sun more timid what can you experience during the beautiful tropical summer in Mauritius? Plenty of bright sunshine as Mauritius starts to heat up and inviting turquoise lagoons with crystal clear waters for sure! This is summer in Mauritius! Summer in Mauritius, which starts in November and lasts through April, is very hot and humid. The fine sandy beaches are definitely one of the greatest attractions; both for tourists and the locals. There you can snooze for that perfect suntan, build sand castles with your kids or have terrific plunges and wave jumping in the warm waters. Those who are not water sports averse won’t be disappointed. once you step out of Mauritius Airport. My favorite beaches during summer are Mon Choisy, Belle Mare, Flic en Flac and Blue Bay. The gorgeous landscape of Le Morne Brabant with its friendly village folks often tickles my adventurous moods! I usually spend a whole day out there. Here we go. . . one-two. . one-two. . .
At night when the sky is clear I enjoy lying on the beach looking at the scintillating stars of the Milky Way. The moonlight's shimmering reflections on the dancing waves and the gentle caressing twirls of the cool night breeze cannot miss to induce you into a quixotic mood. Rain, Rain, Rain . . .? On the coasts of Mauritius, rainfall may be abrupt and short-lived as compared to the mountainous highlands where it can be torrential at times. If it starts raining when I am having a swim in the sea, I truly enjoy the prickly contact of the chilly rain drops on my body as I surface from the warm seawater. Some people say this cleanses one’s aura. I cannot say for sure because I don’t know. But what I really love though, is this tantalizing pleasurable moment. When I am back home and a shower later I’ll usually have some fruit juice with biscuit manioc. Hmmm. . . Life is so fun in Mauritius! Traveling to the mountainous regions will cool you down from the hot beaches. On a sunny day, the refreshing breeze of lush vegetation redolent of endemic and pine trees alongside magnificent gorges opening on mesmerizing views of the deep blue sea will enthrall you. 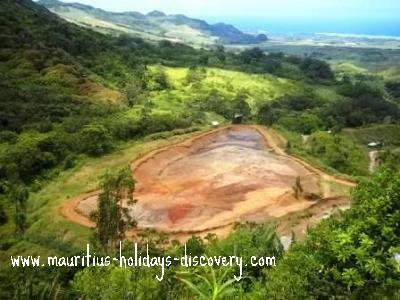 As you hike in the upland forests of Mauritius, the melodious chirping of red cardinal and Pic Pic birds will make you wonder whether you are in Paradise. 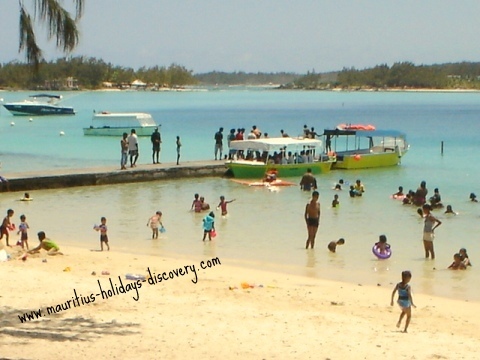 After all, Mauritius is often referred to as Paradise Island! I love walking in the rain and if you feel the same, or perhaps like dancing in the rain (I haven’t enrolled for my dancing lessons yet. Hehe! :-) ) , don’t miss the chilly showers of the mountains. It is really enjoyable. Carpe Diem! Thunderstorms and chain lightening often accompany torrential rains which are likely though not frequent during summer. It is advisable not to visit the upper lands during heavy precipitations. Mauritius weather in summer and tropical cyclones go like sun lotion and sunglasses. The rise in sea temperature in the Indian Ocean favors the formation of strong tropical storms which potentially may hit Mauritius. You will have to stay indoor when cyclonic conditions are prevailing. Many hotels will organize activities to cheer up their guests. The passage of a tropical storm is an experience in its own; frightening for some and exciting to others. Each year around a dozen cyclones are formed in the Indian Ocean. However, for years in a row none may cross over the island. December through January is the peak season for tourists arrival. Flights to Mauritius are generally full. 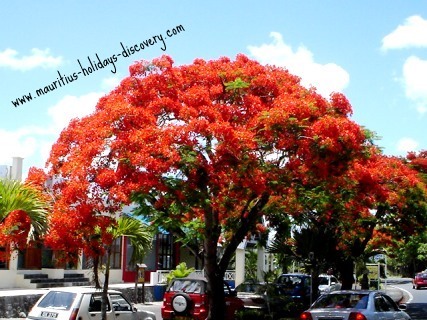 All around in Mauritius blooming Flamboyant trees colour the island with brilliant red summer flowers. It is also the time for wonderful shopping experiences in trendy shopping malls at Sunset Boulevard, Grand Bay and Le Caudan Waterfront, Port Louis during the New Year festivities. When you are in Port Louis, don’t miss a visit to the central market. There you can slake your thirst with citron pressé and enjoy plenty of sun ripe tropical fruits. Fleshy litchis and succulent watermelons are available at the beginning of summer whereas mangoes and pineapple can be enjoyed till the middle of the season. Avocados are generally picked in March through May. (My tip for a hearty lunch: try grilled fish seasoned with lemon juice and fresh parsley accompanied by an avocado salad). Ancestral traditions are deeply rooted in Mauritian Culture. If you happen to see folks taking a holy dip in the sea and offering flowers and fruits to the Sun God on the beach in the early morning of 14th January, you know its Makara Sankranti. It is a Hindu ritual to celebrate the transition of the Sun from Dhanu rashi (Sagittarius sign of the zodiac) to Makara rashi (Capricorn). The festival usually takes place around three weeks following the winter solstice in the northern hemisphere. That day is considered an auspicious phase in Hindu Astrology. In late January or early February, Mauritians whose ancestors came from Tamil Nadu, India take their ritualistic purifying bath near river banks or in the sea. Clad in fuchsia woven cloth they will then march in procession to temples for the Thaipoosam Cavadee prayers. If you went to the mountainous highlands, you would have certainly visited Grand Bassin. The lake is considered sacred and thousands of Indo-Mauritian will proceed there, in late February or early March, for the Maha Shivaratri (literally the great night of Shiva) rituals in reverence to Lord Shiva. 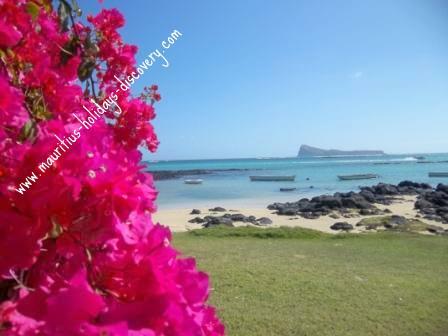 Beach picnic parties on Easter which color the cultural diversity of Mauritius mark the end of a long period of prayers and fasting for Mauritians of Christian faith. Christmas and New Year festivities are universally celebrated by all locals. You’ll be amazed by the extraordinary flares of firecrackers illuminating the sky on New Year’s eve. Mauritius weather in summer is hot and sticky. If you plan to visit the island during that season avoid packing heavy clothing. Bring light, loose fitting material made out of cotton. During the summer months mosquitoes proliferate. It is advisable to pack anti-mosquitoes cream or spray. The table below shows the mean maximum temperature, in degrees Celsius, during summer season.